Everyone’s favourite Tramp. Chaplin’s expressive face added so much life to his black and white picture shows. Use Theater Mania’s easy to follow Chaplin make-up tutorial to enhance your facial features. Chaplin’s iconic look is made up of the very important bowler hat, short mustache, baggy trousers, tight coat, patterned vest, white dress shirt, and your choice of a cane or umbrella. No need to run to the store to purposely buy ill-fitting clothing though, just borrow your key items from some friends who wear different sizes. Can it be any easier? This one is for you and your bff who both didn’t have any costume ideas…until now! The look is simple: black suits, ties, and sunglasses. You can decide which one of you can be Agent Jay (you get to don the mustache! ), and who can be Agent Kay (comb back that hair, you’re a veteran). The prop guns would be a great added touch, and the iconic neutralizer. If you have a plushie of a pug (or the real pup if they don’t mind being awwed at all night), don’t forget to bring them along. If you haven’t heard about Tig Notaro’s HBO special Boyish Girl Interupted stand-up show that aired this summer, you’re really missing out. Blunt, and honest with a perfectly timed delivery, Notaro’s deadpan story telling is memorably hilarious. Her outfit for her show was simple: black blazer, unbuttoned white dress shirt, and jeans. To remake her poster image, make your own prop of glittery ice cream cone, and add some glitter to your face too. Those who have seen the show will get it, and love this fun idea. Carry around a microphone with you too, just be aware that you’ll probably get asked to tell some jokes. 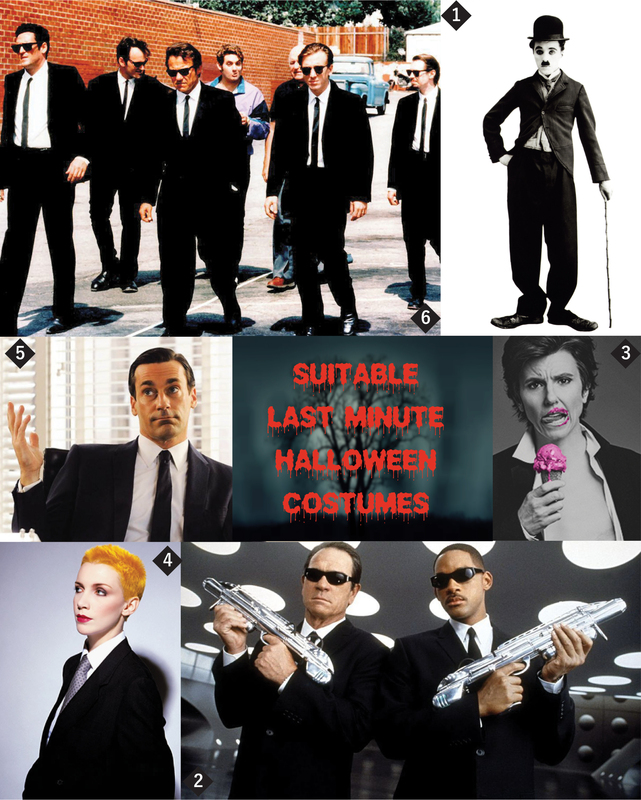 A great androgynous icon of our time, you can make this sweet costume work with just a few items from your closet. To make Lennox’s Sweet Dreams look you need an orange pixie cut wig, black suit, white dress shirt, and gray tie. Her make-up and black satin gloves will help you stand out as the sensual badass herself. If you want to be more obvious, you can throw in headphone set as your microphone. You’re suave, mysterious, you must be Don Draper. Because Mad Men has been on the air for 7 seasons, this costume has a wider range of suit colors you can play with. Ensure your suits are fitted, but don’t stress out about how your suit isn’t the exact 60’s silhouette (bonus points if it is! ), you can still have a killer look. The Don Draper aesthetic: suit in neutral colors (black, brown, blue, gray), striped or solid tie, neatly coiffed hair, and the optional white pocket square. To really sell his look: carry a cigarette with you, a drink that probably needs to be freshened up, and look tortured as if you have a dark secret hanging on your shoulders. You can’t beat the criminally cool gang from Reservoir Dogs. You can do this idea with 4 other friends who need last minute costumes too, but this still works well if you’re flying solo too. The key pieces are: a black suit, white dress shirt, black skinny tie, and black sunglasses. Don’t forgot to keep your eyes on detail for when you pick your specific criminal though (ex: Mr. Pink has specific facial hair, Mr. Blonde wears a gun holster, etc). Practice your slow mo walk with your gang for your grand entrance into the party. I’ll go for Annie, looking at the images of her during that era, she was so ahead of her time. I looooved her look during that era, it was so bold! Agreed completely, Annie Lennox’s 80s looks were incredibly bold! You can recreate her aesthetics in any decade, and you would still look timeless. She really paved the way.